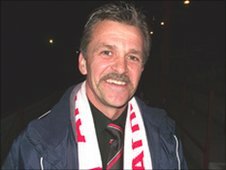 New Scarborough Athletic manager Rudy Funk says he is confident he can bring success to the club. The former Shirebrook boss took charge of Athletic at the beginning of April following Paul Olsson's departure. "Looking from the outside in before I came manager here I knew it was a big club," Funk told BBC Radio York. "But now I've been involved in the club I think it's unbelievable. From where I'm standing it's exciting and it's a great move for me." He added: "There'll be some exciting times to come and plenty of success with it. "I've been around the scenes for a while and I've had some success with different sides. With Rainworth it was fantastic and I'm very grateful to everyone who backed me and helped me there. "But being involved and being given the post of manager of Scarborough Athletic is something special. "I'm sure managers up and down the country would like to be involved in a club like Scarborough."